Pressefoto  vom 06.08.1926 aus Warren, Pennsylvania. Es zeigt einen am Freitag, den 06.08.1926, durch Blitzschlag verursachten Raffineriebrand am Areal der Wilburine Oil Company. Das Foto verdeutlicht die Machtlosigkeit der Löschkräfte bei einem Kerosin– und Benzinbrand sowie interessante brandtechnische Details (Schwelverhalten). Details zur Erdölförderungsgeschichte von Warren finden sich hier. 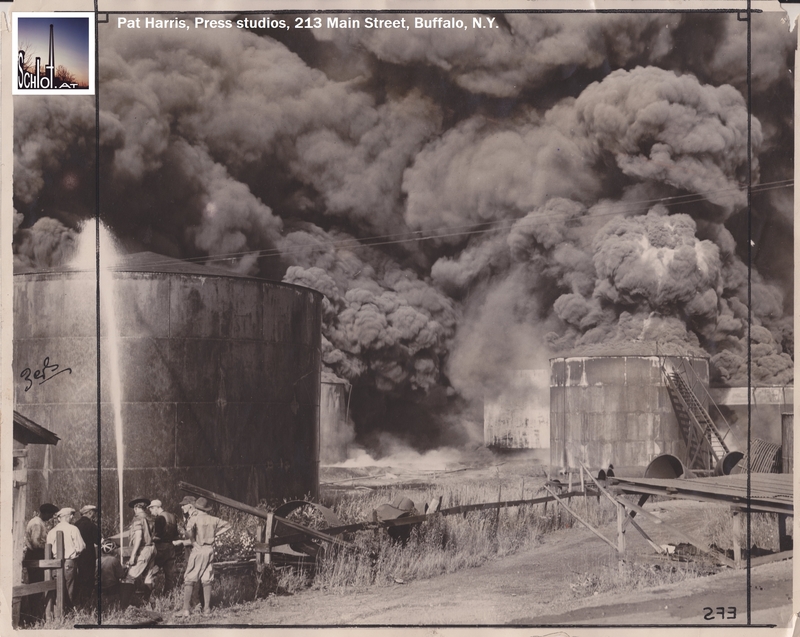 Warren, PA., Aug. 6, 1926-Warren this evening is facing the second terrible oil refinery fire within a month as flames are now tearing their way through the plant and tank field of the Wilburine Oil Co., inside the borough limits. The fire started this afternoon whne lightning hit a refuse tank in side the working yard of the refinery plant at the foot of Cedar street. Flames immediately envelopped the tank and a fire alarm drew out of the apparatus. The flames spread from the tank, spread to the pump house and hose house of the refinery, envelopping both with flames and effectually shutting off prospects of pumping oil out of the tanks. Ten tanks are now ablaze and burning. The tank first struck contained twenty-three feet of gasoline and the bolt knocked the bottom out of the tank allowing the contents to escape and the flaming stream surrounded out tanks near; a big storage house containing four big tanks of kerosene was set ablaze and burned.